A long time ago in a development studio not terribly far away, the idea was hatched to combine a beloved children's toy with a paradigm-shifting film franchise to make one of the most innovative licensed games to date. Since then the LEGO train has kept chugging along, claiming series after series as it goes to which to add its now-familiar brand of homage-paying cartoony slapstick and all-ages accessible gameplay. It's gained its fair share of critics who fault it for not innovating enough with each release, and while LEGO Star Wars III: The Clone Wars isn't far, far from the tried-and-true formula, its content is all-around high quality. 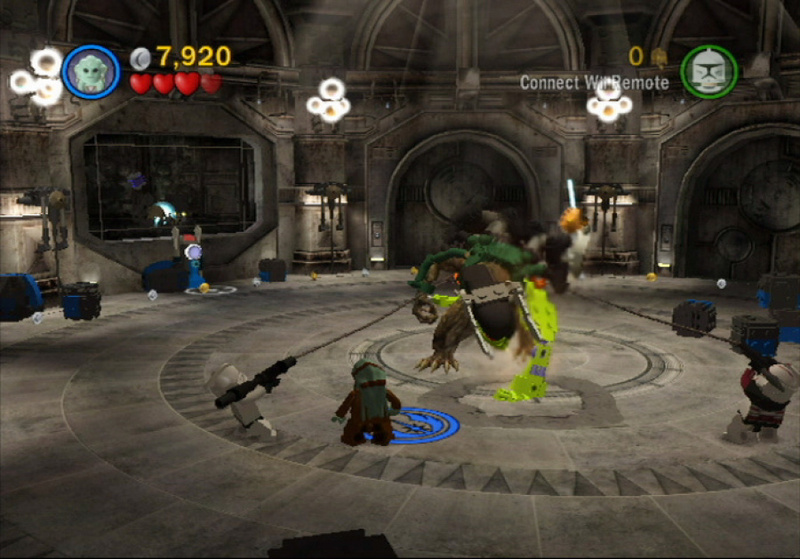 While the first two games in the series followed the familiar films, this entry takes the spin-off TV series The Clone Wars as its source. This is both a blessing and a curse: it's less familiar ground, but that means an all-new story for many. Unfortunately LEGO people can't talk, and while the narratives bracketing each stage help out, their comical mumbling can make things rather confusing at times. The LEGO games combine platforming with elements of action, puzzle-solving and old-fashioned beat-em-up. One feature that sets them distinctly apart from other games is stud collecting – whatever you move or destroy will spit out anywhere from five to a few dozen studs, tiny LEGO pieces that act as the game's currency. You use these almost exclusively to buy different characters, vehicles and other unlockables to mess around with in Free Play and the hub world. Another of the series' trademark characteristics is that you can never die – once you lose your four hearts, you'll simply expel a quantity of studs and continue. This could have the unfortunate consequence of making each combat sequence feel gruelling and pointless thanks to the greatly reduced stakes, but the ganes largely avoid that by making the fight secondary to your main objective. You'll battle swarms of enemies, but at the same time you'll be solving puzzles, blocking passageways, progressing toward the exit and more. Very rarely is hack-and-slash the central focus, which immensely helps keep things interesting. Many baddies take a bit more than a repeatedly pressed B button to defeat as well, and quite a few of the fiercer opponents and bosses require a stimulating amount of lateral thinking. Of course, some of these multi-step fights are quite simple, but there are enough complex moments to keep you thinking and on your toes for much of the time. New techniques like lightsaber-throwing feature as well, and they help break up the action, though they become more of an integral part of puzzle-solving and tactical platforming than fighting itself. There's nothing dauntingly difficult, but the majority of events are still immersive and entertaining. The controls are intuitive and smooth, save for a few somewhat clumsy interactions with the Force that take a little getting used to – you hold down Z near certain objects and either move them about or watch them assemble themselves, and thankfully it's generally the former here, meaning that things never feel overly automated. Also helping compensate for the often less than complicated combat formula is the rather intelligent design of many of the action sequences. Take for example the fight between a rival and her troops atop the carcass of her giant, defeated mech as it plummets from high in the sky, your characters' feet occasionally leaving the ground as you navigate its surface and aim for the enemy. Platforming segments are intelligently designed as well, as are many of the puzzles. Much of it, however, comes down to atmosphere. The graphics are lush and dynamic and the symphonic soundtrack is extremely impressive too, changing to suit the scenery, creating a wonderful ambient experience. Many of the environments are downright striking, including a genuinely scary walk down an underground tunnel, lit only by shaky flashlights as screeching, yowling zombie-like creatures chase your small squadron as they search for a way out. Another stunning moment is a boss battle that, on top of its challenging strategic elements, features floor-cracking stomps, blurring fog and a fan that creates a semi-strobe effect. The camera can be a bit restrictive, but rarely does this become a problem unless you're headed toward the screen, which generally means you're going the wrong way. Vehicle segments are few and far between, and the flight scenes are on the restrictive and unintuitive side. A few driving-heavy stages take the gameplay in a new direction – you'll find yourself controlling mechs, vehicles and troops in battle, taking over enemy bases and using weapon generators to amass a front. These segments aren't as smartly designed as the platforming bits but provide a decent diversion, albeit one that lands on the repetitive side as in spite of the large choice of armaments, you'll use few, and none in terribly unique ways. The first time you encounter one such stage you'll likely have a bit of trouble as instructions are few and fairly cryptic, as are descriptions of weapons that you can generate. You do so by buying them with your collected studs, providing their first non-aesthetic use, and running around trying to amass more because you've accidentally purchased the wrong object can be a real pain. Guidance is limited throughout the majority of the game as well, and while largely it doesn't hurt the experience, you'll find yourself stuck and wondering what to do on more than one occasion, only to find that a simple solution was right in front of you the whole time. Another player can drop in or out at any time for cooperative play. 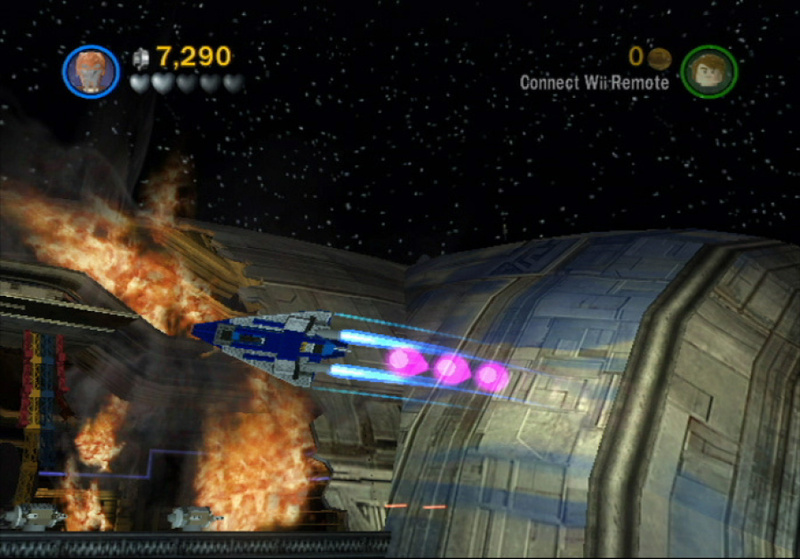 There are very few moments that deeply utilise two characters at once, and there are many times where your party will split up – in one-player mode, you'll swap between two scenes, one of which will remain picture-in-picture-like in the upper right corner; bring a second along and that person will play that bit instead. If you're alone, making the switch can become somewhat confusing when there are three or more in play at once, especially as you'll have to utilise each of their unique abilities to succeed. The method of getting close to another character, facing them and pressing C feels a bit clumsy at times as well. Another two-player feature is Arcade Mode, which lets you battle it out in a number of variations on the stud-spending, weapon-generating, base-claiming battle bit described above – it works quite well, and is a more enthralling use of the formula than its fairly unchallenging, strategy-light implementation in single player mode. Story mode is fairly short, spanning three episodes of six fairly large stages apiece. You can jump between narratives at will from the mission select screen, which you access from the somewhat expansive hub, the inside of your ship. It's a tad tricky to navigate, but includes ways to play around with every vehicle in the game, create and customise characters and more. The unlockables seem near-endless, and you can go back to any completed mission in Free Play mode with any character you've obtained to access more secrets, hidden areas, bonus levels and more, and it really is a joy to re-explore stages and discover new, fun things hidden away. 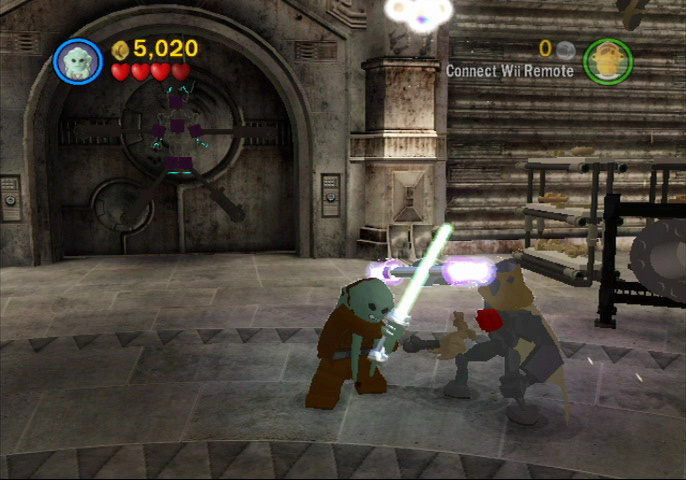 LEGO Star Wars III is a very entertaining and enveloping title. The seeming futility of combat is balanced by ingeniously designed battles, action sequences, puzzle and platforming elements. The game is never difficult enough to alienate its mostly young target audience, nor does it ever feel overly simplistic, and as with all LEGO games it's full of humour and personality. It's an audiovisual feast as well, with atmospheres ranging from lush and sweeping to ominously claustrophobic and genuinely creepy. Some segments are clumsily designed, restrictive or repetitive, but they're thankfully few and far between. The main let-down is the short length of the main story, though there are enough bonuses and collectibles to last countless hours. All in all it's not a perfect game, but the majority of it is surprisingly immersive and fun. Again, I thought this was the 3DS version at first... Oh well. It was a good review. I really want to see a review of the 3DS version, but if this is anything to go by it'll be pretty good. A shame that there is no online co-op, but I think people have given up on asking for that now. I don't mind that I don't know the story as I don't really like the Star Wars films & yet I loved the Lego Star Wars games. All the other Lego games after that I just didn't think were as good (like Batman even though I like the franchise). So I might like this as it's a sequel to the Star Wars ones or I might be disappointed at the lack of innovation in the series as with the others. If I do get a copy it will probably be the 3DS version. Is the 3DS review going to be up before 11PM GMT tomorrow? Might sway my decision about getting this. Already purchased the Wii verion, it's on it's way. Fun times ahead! My wife surprised me with The LEGO Star Wars Visual Dictionary the other day. 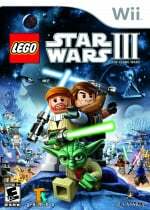 The Lego games are always great fun and the Star Wars ones are still the best, simply because the variety of characters available to play as. The Clone Wars TV show has just been getting better and better but I could see this being a bit less appealing for those who haven't seen it. Will you guys have a review of the DS one up soon? I hope the 3DS version is a port of this one. A good port that is. I'll probably get this on the PS3 for my boyfriend at some point. He loves Star Wars, and we enjoyed playing Lego Batman together. Thanks for the nice comments, everyone. I'd think the PS3/XBOX versions would be the ones to get, personally - I'd love to see some of these incredible atmospheres in hi-def. We're reviewing the DS version as well, and you can expect a review of that very soon. We're also reviewing the 3DS edition, as well as the entire 3DS launch lineup, but that review will not be online before 11GMT tomorrow for sure. Thanks for reading! 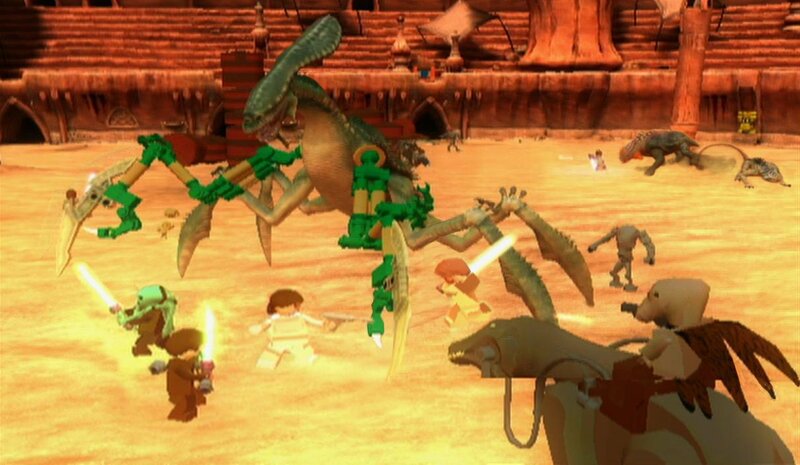 I think the first two Star Wars games are the best LEGO games because they have the best environments. The environments in those games were cleaner with less focus on lots of non-essential game play detail (think Wind Waker vs. Twilight Princess). For me that means it is a lot easier to see what you are looking for and quicker to figure out what you are doing. I've been disappointed with the split-screen co-op (introduced in Indiana Jones II). With that the game feels less co-op, and Star Wars 3 seems to be further pushing the sense of "playing at the same time" instead of "playing together." I'll probably pick this up in the bargain bins (I've gotten all the Lego games except Harry Potter - including the originals on the Cube). As for versions, I'd suggest maybe Wii might be best? One of my favorite things about the original Star Wars games is the sound effects from the Wii Remote. For anyone who used to run around making laser gun sounds while shooting guns as a kid the Wii Remote making that sound as you pull the trigger is immensely satisfying . I can't imagine playing LEGO Star Wars w/o it! I might think about this before I buy it. 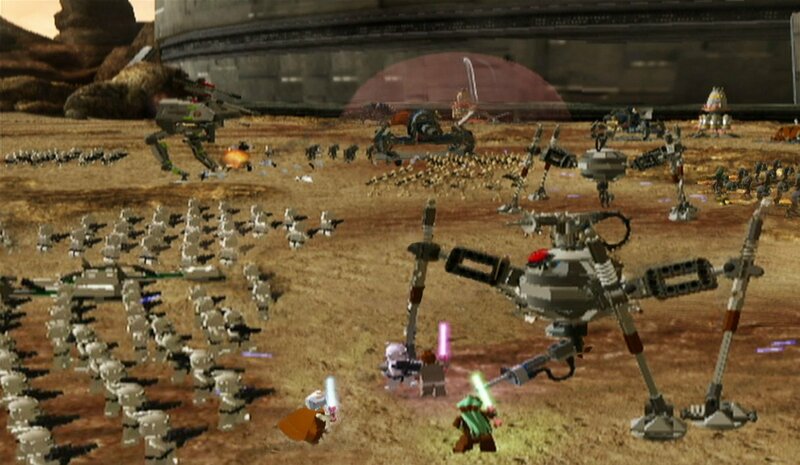 I thought the 1st two LSW games were good and LEGO Indiana Jones was the best, but I always thought the Clone Wars TV show was too overhyped. I could give this game a go, though. "you hold down Z near certain objects and either move them about or watch them assemble themselves, and thankfully it's generally the former here, meaning that things never feel overly automated"
@zack You know that if you hold your Wiimote and nunchuck upright and alternate, shaking them along the "Z-axis" (like shaking two soda cans at once) while holding "z" on the nunchuck, it is possible to make your character to build faster. @shinesprite Indeed, but to me that's the difference between watching an animation and watching an animation while fastforwarding. Regardless, the majority of interactions here refreshingly require that you do more manual work than just holding down a button or holding down a button and waggling, so it's kind of beside the point. I hate The Clone Wars Series, but I love the Lego Star Wars games. I'll probably rent this, then. Does this game have the level builder like the previous two Lego games (Lego Indiana Jones 2 and Lego Harry Potter Years 1-4). If not, thats a bit disappointing. "LEGO Star Wars III: The Clone Wars" is an awesome game!